This NIR-enhanced camera offers increased sensitivity in the NIR range. It achieves this through the use of a thicker substrate layer that is significantly simpler and more cost effective than previous CCD technology. 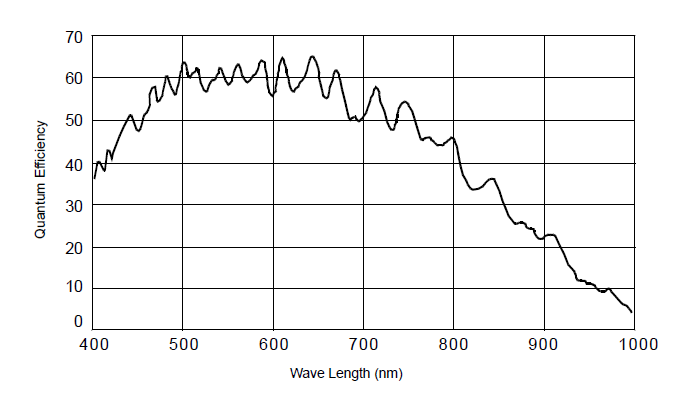 It opens up an entirely new world of applications for projects that require good sensitivity in the near-infrared range, with wavelengths that must measure over 850 nm. This camera offers quantum efficiency of around 40% in the 850 nm range, or about twice the efficiency of non-NIR-optimized cameras. The Basler ace provides a full set of features to address a wide range of applications. You may adjust the camera’s black level, gain, and area of interest. Up to eight areas of interest may be "stacked" and output as a single image. There is support for pixel binning, mirroring, test images and a luminance lookup table. Parameters may be sequenced for fast on-the-fly changes. The camera can automatically set gain and exposure, either once or continuously, based on the intensity of pixels in an image area of your choosing. This camera interfaces with Base, Medium and Full CameraLink frame grabbers. It supports Power over Camera Link (“PoCL”), eliminating the need for a separate power supply and an additional cable. Or, the camera may be powered via its auxiliary connector. The auxiliary connector is provided for terminating the general purpose input or output signal. Configured as an input, it can trigger image acquisition. Because the Basler ace camera uses the same 29 x 29 mm footprint that has been standard on analog cameras for many years, replacement of analog cameras is easy. Some existing Camera Link cameras having this same footprint can also be easily replaced. This camera's sensor measures 12.75 mm diagonal. If you use the full sensor, some vignetting may be visible when combined with a 2/3 size (11 mm) lens. We recommend our LSKA22_ lenses for most installations.